After battling for months with slow Brita filters I stopped using them entirely. 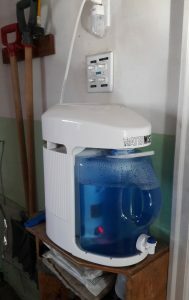 A water distiller is far better than any brand of water filter in my opinion. Distillation removes more contaminants and minerals in tap water than any filter can. A good water distiller will remove chlorine and fluoride, the two most common additives in treated municipal water. It can also remove volatile solvents like benzene and toluene, as well as heavy metals. None of these chemicals are good to ingest. Fluoride in tap water is not the pharmaceutical grade stannous fluoride in toothpaste which is there to prevent cavities. The added fluoride comes from totally different chemicals. The most common are fluorosilicic acid, sodium fluorosilicate and sodium fluoride. Typically, these chemicals originate from pollution control devices used in the phosphate fertilizer industry. Recently, some cities started purchasing the chemicals from Chinese industries for cost reasons. Regardless of the source, the added fluoride is not a pharmaceutical or food grade material. It is an industrial waste and likely to contain unwanted contaminants, including arsenic. A water distiller–like those sold by Waterwise–is the best method for removing fluoride and its contaminants. I’ve been using the Waterwise 9000 model for over twenty years and love it. It produces a gallon of purified, distilled water in four hours. The boiling cycle begins by letting some steam escape for about fifteen or twenty minutes. This removes most of the volatile chemicals like solvents. Then the distillation cycle begins. An activated carbon filter further cleans up the distillate. The result is pure water. The distiller itself appears to be a design by GE. The brand name Waterwise is now well recognized and I have had excellent service and support from the company. Compared to other small appliances–think toasters, toaster ovens, microwaves–the water distiller has been much more reliable. I run my Waterwise 9000 once or twice every day, and it just keeps working. I had the first unit refurbished once in the twenty years it operated. By the time it needed a second overhaul, I had to buy a new unit because key parts were no longer available. Microwaves and toasters only last about half as long and usually can’t be repaired. I give the Waterwise water distiller my unqualified recommendation. I do benefit from the distiller promotions on this site. I choose to promote these products because I have direct experience with the company and I think they are superior in performance and value. 13 April 2018 – I’m testing an Epic Water Filters pitcher, which appears to be a superior product over Brita and I’ll post the results here on Helioza. Visit this link for a 15% discount on any purchase from Epic Water Filters. If you decide to buy an Epic product, I will earn a commission on your purchase. If you don’t, I earn nothing. I’m doing these tests because I am disgusted with Brita and think the Epic products will perform much better. Your discount should be automatically applied at checkout. If for some reason it doesn’t work, then just enter the discount code helioza on the checkout page.